This certainly looks interesting. If anyone knows more about it, please pass the information along. I would also like to have more photos as the construction progresses. Just a little more info for you about this one...it is a 3 story European stone construction that opens on a private courtyard...there is a three level underground basement as well which houses select wines...Wine tasting events are held there and I have just found out that a benefit event will be held on April 5 with a renaissance theme (guests are invited to come in costume and enjoy an evening of food, drink, and Celtic music). It's pretty spectacular. The castle is 3 levels above ground and 4 below with over 120,000 square feet of space. The great hall has a real fresco, and the facility includes dungeons with torture chambers, a church, and a drawbridge with a mote. The stonework throughout the castle varies as though from different periods of time, just like the towns and different castles throughout europe. Daryl Sattui included elements from dozens of different castles throughout europe that he liked in this castle. It will open as a fully functional winery when it is ready. Last year marked the first official vintage for their wines. For a view of the castle, you can ride the tram over at silverado i believe, across the highway. Enjoy!! 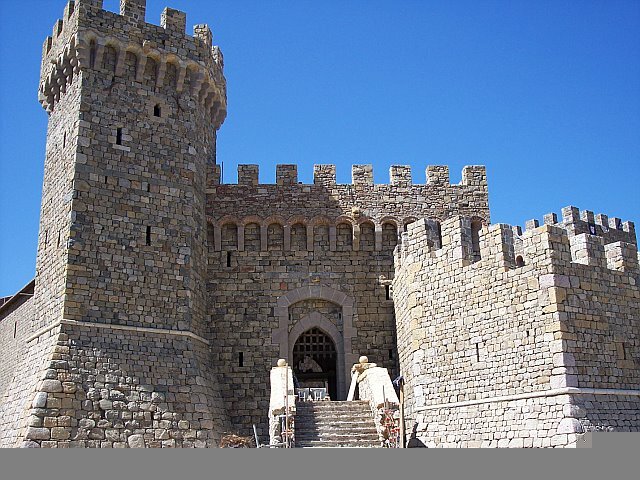 The Bachelor TV show featured this 12th century, authentic Tuscan castle in the Napa Valley. Thanks to Phil Bilzor for finding this castle.